The origin point of this look actually centered on petal-soft spring-time pinks. Following the Alice Lane principle that if you want to know what would look good with a given color, you should go look what sits next to that color in nature (“If it occurs in nature, it makes sense,” she says), I dug around my photo archives for some examples of warm pink blooms and blossoms in nature. 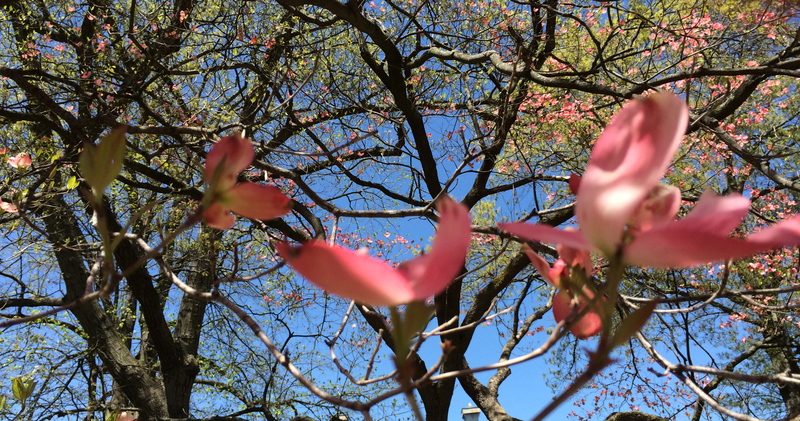 Last year’s early-spring blossoms. Can’t wait for this year’s!! This made me think about soft, luminous blues and greens and warm pinks, worn together. 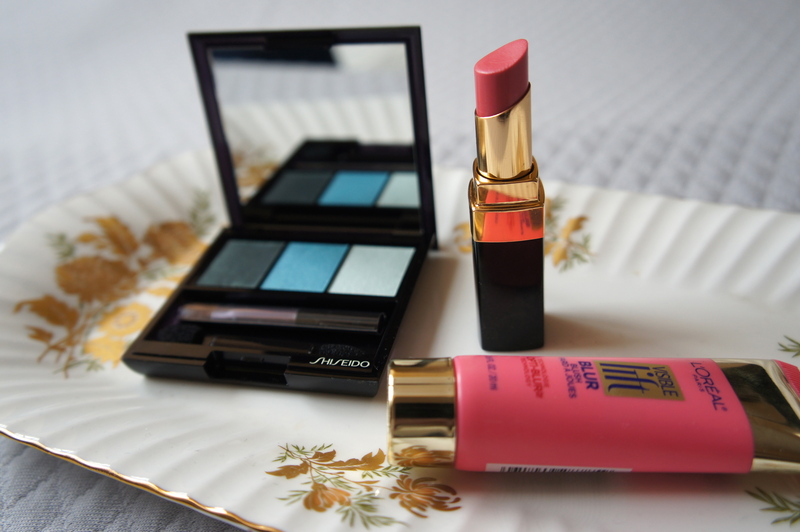 I dug around a bit in my stash and finally settled on the Shiseido trio in Lido, for its shimmery, light-reflective quality; a sheer, creamy warm-pink lipstick; and a pink cream blusher. Although petal pink was my starting point for the look, it stood to reason that a haze of gray-green and teal-green eyeshadow would probably make the eyes the central focus on the look. Shiseido Luminizing Satin Eye Color Trio in Lido; Rouge Coco Shine in Romance; L’Oreal Visible Lift Blur blush in Soft Pink. From the left: Dark, medium, and light shades from Shiseido eyeshadow trio in Lido; Chanel Rouge Coco Shine in Romance; L’Oreal Visible Lift Blur blush in Soft Pink. And here’s how I wore it! Whoops, slightly blank expression there! I fell way behind with all the things I was trying to accomplish in a day, and before I knew it it was getting dark, I’d been rubbing away at my makeup with no touchups for hours, and I was losing the light. So I parked myself and snapped a couple of pics double-quick! 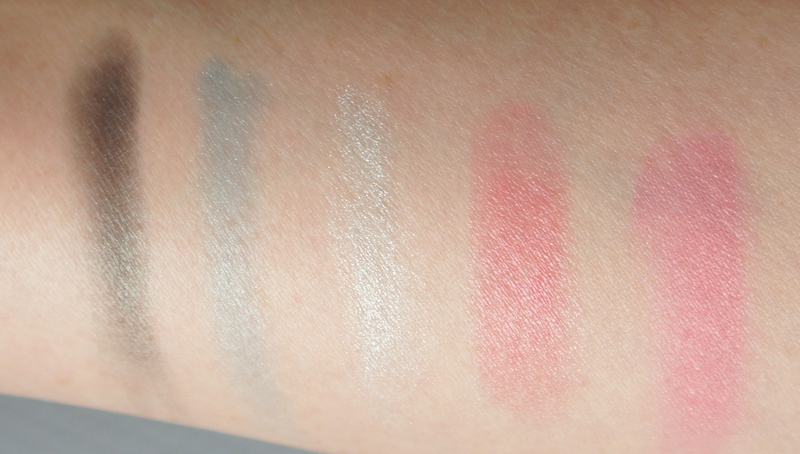 These pics really show the shimmery softness of these Shiseido shadows. In real life, the green impression was quite a bit stronger. Base. 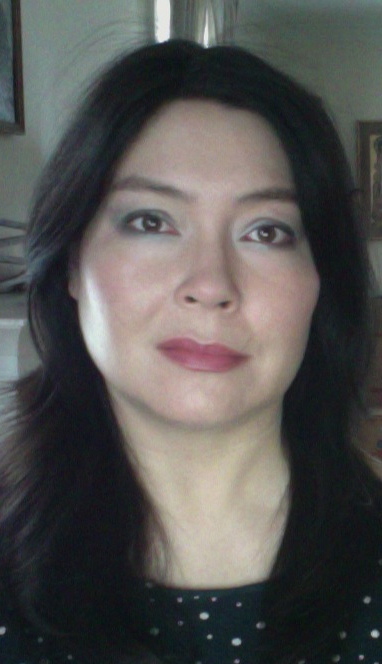 Very light base here–just a bit of By Terry Sheer Expert foundation and a lot of Clinique Airbrush concealer (I missed a bunch of spots with this). With my sensitive skin, piling on a lot of base products to conceal redness just makes me more red, so when I get all reactive and pink-skinned, I just try to live with it as best I can until it passes. I filled in my brows with just a wee bit of Anastasia Brow Wiz pencil in Ebony. No highlighter, no bronzer, no powder–best to keep things minimal when my skin is being so fussy. Eyes. Although it’s hard to see here, I placed a big haze of the medium blue-green shade all around my eyes, along the lower lash line and up into the crease. I blended that out up to my socket line with the palest shade in the palette, dabbed a touch of the palest shade in the inner corners, then added the darkest shade in a hazy line along my upper lash line and about a third of the way in from the outer corner along my lower lash line. 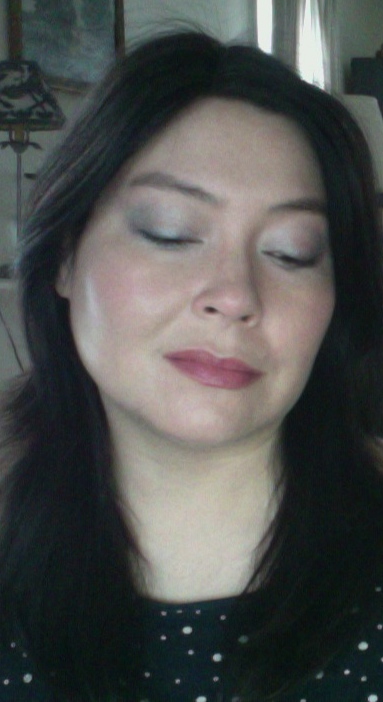 The effect in person was a big, hazy, green-teal cloud with a bit of extra definition along the lash lines. I think I could’ve lined all the way around with a hazy-soft line of the darkest shadow, and the final impression would’ve been more subdued and a tad more defined. Chanel Le Volume mascara to finish. Cheeks. It’s hard to tell because I was sporting so much surface redness, but I did pat a little of the blusher on the apples of my cheeks, just to show you. Lips. A slick of the Chanel lippy, straight from the bullet. And that’s how it all turned out! It was really nice to wear some refreshing, luminous shadows around the eyes and some petal-soft pinks on lips and cheeks. I was extra-pleased that my inspiration to wear some nice green was falling around St. Patrick’s day. Lá fhéile Pádraig sona dhaoibh! Happy St. Patrick’s Day, everyone! Blessings to all. When St. Patrick’s day arrives, I know spring is just around the corner (plus maybe a pint of green beer 🙂 ). I love this soft and pretty combination, bunikins! Thank you for brining a taste of spring to life here. It is MOST appreciated consider I saw a few scant snow flurries this AM in my neighborhood! I’m so glad you liked it! Of all the eyeshadow shades, I feel like I’m least likely to wear greens. I need to branch out more! lol. Raising a big pint of green beer to you!